Jackpot Capital Casino sure knows how to start the new year right! They're giving away $130,000 during the Welcome to the Future casino bonus event that starts today. For the next five weeks, frequent players can win bonuses up to $800 every week and even occasional players can win in weekly random draws. At Jackpot Capital you'll earn points just by playing in the online casino or mobile casino and you'll get weekly bonuses based on your points ranking. Bonuses up to $800 a week for both frequent players and occasional players. Every Monday the trusted online casino will give $21,000 in casino bonuses to frequent players and another $5000 will be randomly awarded every Friday. The Welcome to the Future event continues until February 12. 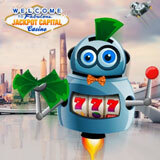 Jackpot Capital Casino offers hundreds of games from Realtime Gaming. The most popular games, including the new candy-themed Sweet 16 with new “Morphing Symbols” are also available in the mobile casino (http://www.m.jackpotcapital.eu) for smartphones and tablets.